I have a confession to make. Years ago, I was semi-obsessed with Martha Stewart. “Semi” in that while I did drive past her Connecticut farmhouse, I didn’t peer through her windows with binoculars (forgot them at home) to see if her magazine living room was in fact her real living room. I did collect every paint chip from her interior paint line, I attempted (or planned to, or fantasized about) every craft project and Good Thing, and to this day I own many years’ worth of Martha Stewart Living magazines, mostly the mid 90’s through the early 2000s. I ate up her advice like whipping cream, the essential rickrack, frosting windows, cornhusk crafts, pressed seaweed, chintz, decoupage! Tomato aspic! Don’t know what half those things are? Just wait! The one thing I rejected like curdled goat’s milk was a monthly feature called, Martha’s Calendar−her personal daily to-do list. It was mostly chores and house maintenance tasks that “she” planned to do and wanted to remind others about. Who needs Martha Stewart to nag them about doing drudgery? That’s what family is for. Plus, her to-do list was a far cry from the rest of ours. Did she intend for this to be a peek into an elitist farmer-collector-decorator-entertainer lifestyle or was she trying to inspire? It ran for a short time. After all, who but Martha Stewart has winter and summer curtains to switch in and out? I recently had the urge to pull out a vintage MSL, and fell upon Martha’s Calendar with the same fascinated voyeurism I had years ago. Here is a compilation of some of the best Calendar entries. I’ve provided a handy-dandy how-this-might-apply-to-your-life translation. April 1, 2001 – Count canaries. This was a stumper. Martha owns canaries, but doesn’t know how many? That’s a lot of canaries. But why count them? The closest thing I have to birds is a roast chicken in the fridge and a down pillow for overnight guests. Tally: approximately 2. April 2, 2001 – Wash and seal stone floors. Wow, this sounds awful. In lieu of stone floors, remove nail polish from white bathroom tile floor where daughter has dropped a shocking shade of fuchsia. April 4, 2001 − Sow tomatoes in greenhouse. Plant herb seeds for a clay pot herb garden. If they don’t germinate, buy small herb plants from Home Depot. If they die, buy basil at the grocery store. If you’re too busy counting canaries, use the dried stuff. April 5, 2001 − Begin transplanting seedlings; apply horticultural oil to fruit trees. Drive your seedlings to school. Moisturize their arms and legs before leaving house. April 8 – Organize linen closets. Be happy you have clean linens and go make a terry cloth rug out of old towels! March 4, 2002 − Finalize tax returns. Ah-ha! Just figured out why Martha’s Calendar was canceled. April 10, 2001 − Open pools in Westport and East Hampton. Order a Slip ‘n Slide from Target.com. Have it shipped in time for Memorial Day. April 1, 2001 − Take final test for pilot’s license. Hmm, another toughy. If you want to feel like you’re flying, go get some dental work done and ask for the laughing gas. April 9, 2001 − Return from Japan. Order sushi for dinner and pick it up. Return from Japan(ese restaurant). December 13, 2002 – Wash all light bulbs. If you have the time, desire or inclination to wash your light bulbs, you have bigger problems than I can help you with. January 22, 2003 – Rotate mattresses. You’ll need assistance for this, so be sure to ask your husband 3 days in advance, so when he says, “I’ll be right there,” it’ll be done exactly when you intended. June 8, 2001 – Clean behind washer and dryer. Barring the possibility that you are a contortionist, weight-lifter, or wizard, let the dust bunnies be and go decoupage a side table! August 19, 2001 – Go rowing. Here’s one you need not feel guilty about unless you have a canoe, some oars and a body of water handy. Hey, if water is handy, consider making pressed seaweed art instead! April 17, 2000 – Clean chicken coop. …I guess you could clean out your refrigerator…another job I dread. My rule: never clean anything that’s bound to get dirty again. Waste of time. Instead, take all the cheese and veggies you have in there and cobble together a sumptuous quiche! April 6, 2002 – Take down and wash storm windows. Come on, Martha−we know you’re not doing this! Skip the windows and make a gorgeous lampshade out of sheets of birch bark−beautiful when light shines through! April 7, 2002 – Scrape and paint chicken coop enclosure. Enough with the chicken coop! 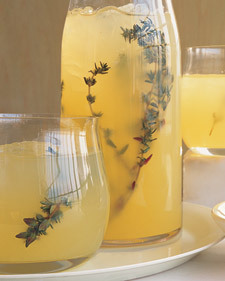 Fix yourself a Vodka-Thyme Lemonade and be thankful it’s someone else’s urge to raise chickens. November 13, 2002 – Wash cats and trim claws. Oh, a cat bath sounds fun and easy! Everyone knows cats love water! Remember, “claw” is a noun and a verb. My advice: get used to the way the cat looks and smells. With the time you’ve saved, make a Grasshopper Pie−Martha’s recipe is to die for. And watch your family’s claws come out! Loved it. Next time I’m I front of my staff I’ll be sure to have them read and tackle the list. Let’s be real no way she did any I those things. You’re not going to address your staff directly, are you? That’s what personal assistants are for! Wash cats! I don”t know about her cats but mine would take out my eyes before they allowed me even to try! with their un-clipped claws, no doubt. Thanks for stopping by K! Laughed aloud as usual, but my favorite responses were to the lightbulb washing, and the mattress rotation. Any look at Martha Stewart other than with your lens would have slathered me with guilt. I will never understand how she told people to wash their lightbulbs. Where was her editor! It’s true that while I was mostly inspired and excited and motivated by her magazine, other times I felt incredibly inadequate. Thanks for reading Peg! I’ve already started combing the back issues for centerpiece ideas. I’ll keep you posted. Thanks for reading, Lillie! I got exhausted just looking at her list and much prefer yours. Wash light bulbs? Does this woman not have more important things to do? My thoughts exactly, Terri! She does seem to fit a lot into her day, but that’s what a staff is for. Luckily my lightbulbs burn out before they need to be cleaned! Thanks for reading and commenting. Next Next post: Do Fiction Writers have an Obligation to Society?